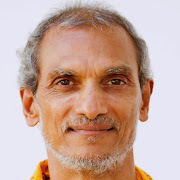 The 40 Days Observance is an annual ashram retreat and online meditation experience hosted by my wonderful teacher Sri Vasudeva and his organization Blue Star. In 2015 I began posting my reflections about his teachings and sharing my own practice insights on Spiritual Forums. I tried to make these very profound and esoteric teachings understandable (as much as I understand them) to people not so familiar with the Sanskrit terminology and advanced meditation. I'm not trying to preach to anybody, just sharing what I knew at the time of writing the post, and looking for answers same as anybody else. Day 2 Mind is not a Brain! Day 17 Keeping my private eye on my "I"
Day 23 No Free Lunch!!! Day 39 The final surrender! Day 5 How Masters help us back to our centre; Who needs a Guru? Day 7 The joy of moving from "doer" to "non-doer"